Now that Agile has reached its full maturity, it's true potential is shining. Twenty-one years after its inception, a third wave of Scrum is rising. Since its introduction in 1995, cutting-edge companies have been ingraining the Agile and Scrum mindset. Looking forward, business leaders are beginning to re-imagine the ways Scrum can be used to improve rhythm, increase focus and simplify processes. Instead of spinning on hamster wheels, tomorrow's future-thinking enterprises want to invest in reflection, improvement, and innovation by balancing the scale, and normalizing Agile. Agile expands beyond IT - Agile is a mindset that goes beyond business. Already, the government is applying Agile in some sectors and kids are learning Scrum in high school. As Agile expands beyond IT, we will see more spin-off services, such as Agile marketing, Agile HR, Agile security and Xtreme Manufacturing. students in less than six months. Balancing the scale, and normalizing Agile - Although some organizations have made successful transitions to Agile, many are still unable to balance the Agile way of working with achieving results and the ecosystem. We see three anti-patterns that prevent companies from reaching their full Agile potential. And, from our work with other companies, we've identified root causes for these antipatterns, and some solutions. More focus on attitude, behavior and culture; less on Agile. Too much attention on methodology creates a dogmatic behavior and people will disengage. Agile is just a bag of new tricks and next year Agile 2.0 will ask for even more change. In the coming time, weÕll see a shift in attention to attitude, behavior and culture in Agile transformations. Letting purpose and goals drive the Agile ecosystem over keeping people happy. Yes, keeping people happy creates a nice, warm kumbaya-like atmosphere. But too much of a good thing can push the bottom line objectives into the background; people lose sight of achieving the right results. Instead, transitioning companies will invest in providing people with the appropriate knowledge to use purpose and goals to drive the Agile ecosystem. Embedding a customer value perspective in the company culture. Some companies embrace Agile, but their old mindset and behavior persists. Instead of putting too much focus on winning and results, companies should instead cultivate customer value. Improving this will put the focus on value, drive teams and create a better company culture. Prioritizing Agile talent management. After governance practices, Agile talent is the next priority. Too little attention on Agile talent management can create major problems down the road. Getting, and keeping, the right people on your bus is crucial for successful Agile transformation and results. The right people can amplify, accelerate and strengthen cultural change efforts. And, as Agile continues to expand beyond the business world, we'll see the demand for specialized Agile positions increase. The figure below provides a governance model that organizations use bring balance to the Agile way of working, ecosystem and results. 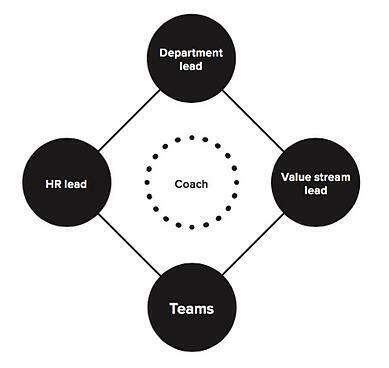 The center of the model shows the goal driven nature of the Agile ecosystem. Goals are balanced between customer outcome and organizational development; derived from a clear and guiding purpose; and embedded in day-to-day routines across the organization. All work begins with customer insights and ideation to optimize the customer journey and fulfill their specific needs. All ideas to optimize outcomes are then prioritized, planned and executed with various other Agile techniques and best practices.